This is really exciting: our team has just wrapped up the work on State of Vue.js—a comprehensive report crafted for developers and technology businesses interested in making educated decisions about their stack. Even more exhilarating is the fact that there’s no other report like that on the entire Web. Inside our 80-page-long compendium, you will find the most essential Vue-related information and business use cases. In case you were wondering, our team spent hundreds of hours to conduct interviews, analyze survey results from 1,126 developers, write and design the report, and plan its release. This blog post outlines the report’s key data points and takeaways. Looking for some hard-to-find Vue trivia to spice up your next party (caution: it probably won’t work for EVERY party)? Maybe you’re looking for arguments that would help you convince your boss that Vue.js really is that awesome? Or maybe you just enjoy reading Vue-related data over morning coffee. Answered affirmatively to any one of the above? This post will definitely help you out. One of the main doubts developers and businesses encounter when planning to add Vue.js to their stack was the future of the framework. 45% of all State of Vue.js survey respondents named it as their chief concern. Many also brought up lack of support for the framework from major corporations such as Facebook (behind React) and Google (behind Angular). On the one hand, such support guarantees a measure of continuity for frameworks, but on the other hand, it makes them dependent on the entity behind them. Vue.js is more community-oriented and tries to answer the needs of developers across the globe. It has come a long way since its first public release (0.8.0 version was released in February of 2014) and by now, Vue is a ready-to-use solution with a great developers backing the framework and comprehensive support. Hear this: 96% of all respondents said they would use Vue.js in the future (I know. I’ll give you a moment to absorb this information). 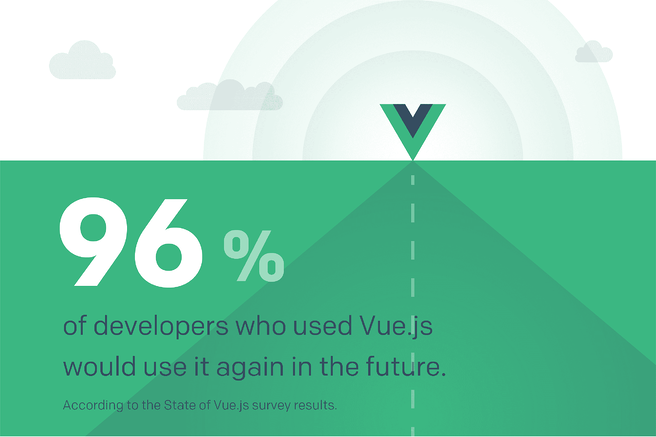 Last year, State of JS study revealed that 89% developers who used Vue would use it again. Many things have changed since then and… now the number is much higher (still, can’t wait to see 2017 State of JS results). Vue.js was created to make programming more enjoyable. No wonder so many developers and businesses want to use it again! Vue.js documentation was mentioned by 60% respondents as one of the biggest advantages of the framework. It was also lauded by all companies we included in the case study chapter. Node.js and PHP are both leading as backend technologies used along with Vue. 53% respondents use PHP, and 45% chose Node.js. Mind that this question was multiple choice. Why so many companies chose those technologies? One of the best reasons to use Vue with Node.js and PHP is server-side rendering. In Vue, server-side rendering has been possible with Node.js for a while now. Thanks to PHP v8js, it is now also possible in PHP. There might be another reason why so many businesses use PHP with Vue. 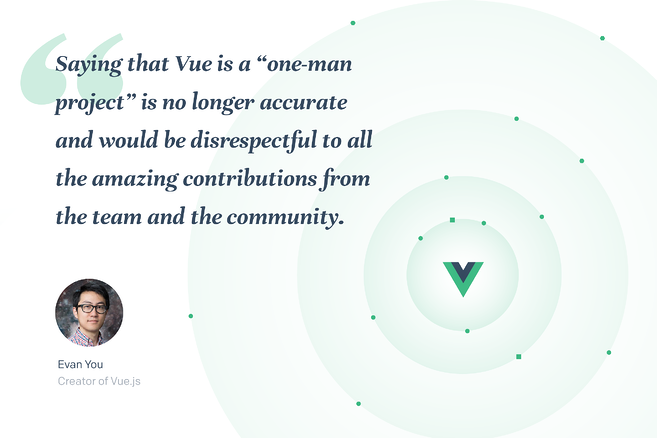 At the very beginning of its existence, Vue.js was noticed by Taylor Otwell, the creator of Laravel (April 2015). That was the the first instance of Vue getting real-life traction. Many companies, already working with PHP, decided to start experimenting with Vue. We may assume that Taylor’s efforts to evangelize Vue may have had some genuine impact on its popularity. It is well known that Vue.js had been adopted by a number of major Asian corporations, like Alibaba or Ele.me. Still, examples are scarce and that, in turn, may have lead some organizations hold back from introducing Vue to their products. 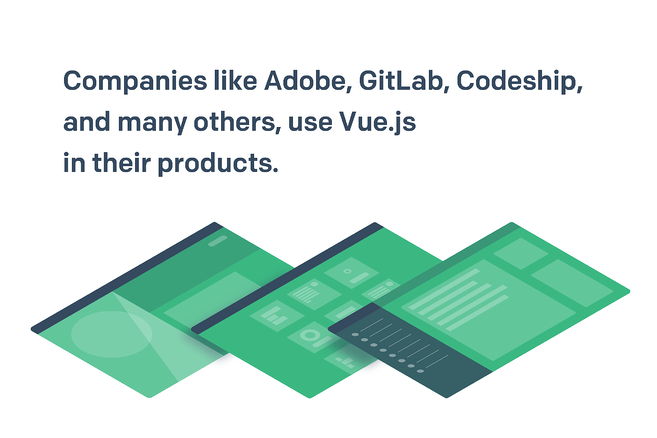 Our report makes it clear, however, that Vue has been successfully adopted by a number of companies across the globe, including Adobe, GitLab, Codeship, and with quite awesome results (See Chapter 3 in the report to read the real-life case studies we’ve compiled.) And the list keeps growing every day. An impressive 81% of developers emphasize ease of integration when it comes to Vue. This very trait of Vue.js was brought up by respondents even more frequently than Vue’s documentation and performance. At the end of the day, it really deserves the Progressive Framework name. Although Vue.js was unanimously called amazing, many developers still yearn for better documentation for the framework, especially architecture-related content regarding bigger apps with more real-life examples. Fortunately, the solution for that issue arrived quickly, as Vue.je core team has just released the official style guide, unavailable at the time of the survey, and there is more to come: "The cookbook, which will begin serious development in November, will help provide examples for larger apps, common integrations, and also explore architecture questions." says Chris Fritz, Vue.js core team member. For most developers using Vue in their work, it was love at the first sight. It’s easy to start working with it (even for less experienced developers), the documentation is just stellar, and it solves a plethora of different problems in a relatively easy and elegant way, like no other framework before it managed to. How come Vue is so enjoyable to work with? Naturally, there are other great frameworks that will probably fit your product fine. Just remember that it shouldn’t matter how popular a technology is. It shouldn’t matter whether one name seems more familiar than another. Just make sure you make truly educated decision and then check whether you’re absolutely sure of your choice. I wholeheartedly invite you to read the full State of Vue.js report—hopefully, it will help you do just that.